What was once Rizk Al-Madhoun's clothing factory. Credit: Eva Bartlett/IPS. 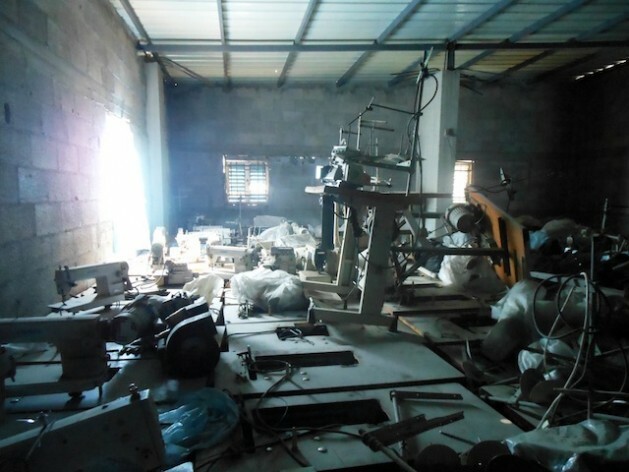 In the no-frills office of his stalled Jabaliya clothing factory, Rizik Al-Madhoun, 41, explains how his clothing factory began shutting down six years ago. Madhoun’s is one of the 97 percent of industrial establishments in the Gaza Strip which by 2008 had stopped production as a result of the Israeli-led, internationally-complicit closure of Gaza’s borders that limited imports and virtually halted all exports. By December 2007, the UN had already reported that only one percent of Gaza’s 960 garment factories remained open. Today, a reported 80 percent of factories in Gaza are still closed or operating at minimum capability. “Until 2005, our work was good,” says Madhoun. “We made shirts, pants, jeans, dresses, skirts, school clothes…we’d make whatever was in demand. Since our clothes were high quality, 80 percent were exported to Israeli markets, and some of these were then exported to European markets. His workers were, Madhoun says, among 40,000 who worked as tailors in Gaza. A tour through the vast warehouse that was Madhoun’s factory reveals much now-unused space, with a few rooms devoted to storing cheap imported clothing. Gaza’s unemployment rates continue to hover at between 35 percent to 65 percent (adults versus those in their early twenties), and food-aid dependency remains at 80 percent. “An urban area cannot survive without being connected,” the UN’s Maxwell Gaylard stated on Aug. 27, reiterating the necessity to reopen Gaza’s closed borders to trade. Rizik Al-Madhoun simplifies the call: allow Gaza’s exports out.